This photo was taken by Laurie Nessel October 14, 2006 at Lost Dutchman State Park. It is taking nectar from Alkali Goldenbush (Isocoma acradenia). 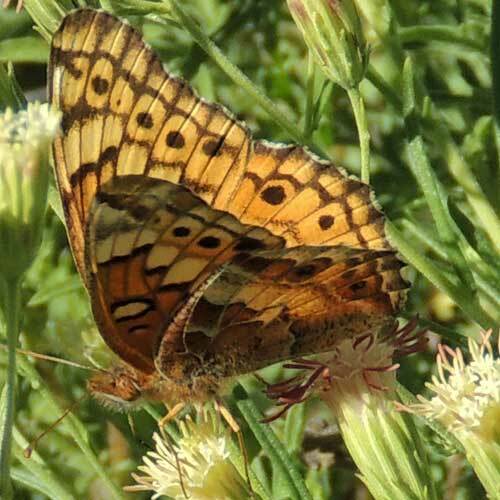 These butterflies tend not to show up in the Sonoran Desert until mid summer and fall. They are partially migratory and apparently move into the desert from more favorable areas to the east and south. Food plants include passion vine, violets and purslanes - plants that are themselves scarce in the Sonoran Desert. Passion Vine is cultivated in urban gardens and this may be where the bulk of breeding in the Sonoran Desert takes place. 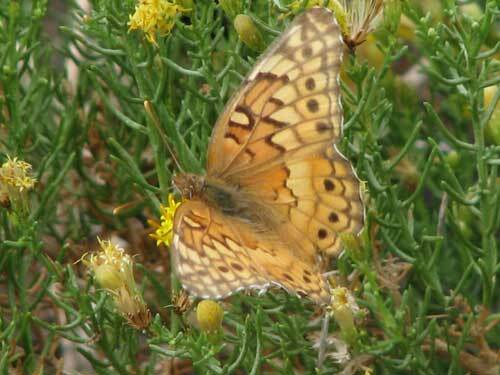 The butterflies come to nectar at flowers, but are quite wary and are sometimes difficult to approach. This image shows the underside of the wings with colors and pattern like a dried leaf. Mazatzal Mts., Maricopa Co., Arizona, Oct. 2011. It is taking nectar from flower heads of Loomis' Thimblehead. Notice that the stamens of the head it is taking nectar from are white, whereas the head to the right has brown stamens.